Performance by John Couch from the CD Selected works by AMC represented artists, vol. 33. De la luz : for guitar / Sally Greenaway. De la Luz - 'in the light' - is a delicate and uplifting solo guitar piece. 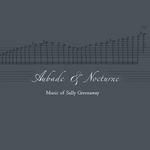 It gently unfolds with a satisfyingly uncomplicated melody. Commissioned by John Couch for his 2013 CD release and tour. I wanted this piece to really show off the beautiful tone of his guitar and the magnificent control of John's playing. Commission note: Commissioned for John Couch. Influenced by Charlie Haden, Keith Jarrett, Tord Gustavsen. 3 Aug 2017: at AFCM 2017: Concert Conversations with Piers Lane 4 (Townsville Civic Theatre). Featuring Kristy McCahon, Timothy Constable. 5 Dec 2015: at Sydney Guitar Society CD launch - Ask Me Tomorrow (Crows Nest Uniting Church Hall). Featuring John Couch. 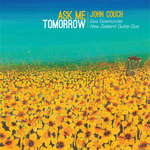 28 Nov 2015: at Ask Me Tomorrow CD launch (Belconnen Arts Centre). Featuring John Couch. 11 May 13: Concert at Torbay, Auckland, New Zealand. Featuring John Couch.